BTW, Aerosmith is Back in the Saddle, but it’s not the Same Old Song and Dance: Guitar Hero Aerosmith is expected to be one of the top-selling games this Christmas (the Guitar Hero franchise has sold more than $1.3 billion since 2005). Plus, Joe Perry makes ‘Rock Your World’ Hot Sauce. There are six Amendments to the Constitution of Alabama of 1901 on the ballot Tuesday. Amendment 1 applies Statewide; Amendments 2 through 6 apply to Shelby, Limestone (City of Madison), Blount, Russell, and Macon (City of Tuskegee) Counties. A friend of mine won’t vote for ‘local Amendments’ because it’s his way of protesting the lack of home rule in Alabama. He figures that if enough people consistently vote NO on local Amendments, maybe the Legislature will eventually support home rule or even a Constitutional Convention. In past elections, I haven’t voted either way on local Amendments, hoping that people who actually know and care about the Amendment will decide the issue. However, this time I’m going to vote NO to all local Amendments. Regarding the local Amendments, the only one that is relevant to the Huntsville area is Amendment Three, which would raise ad valorem (property) taxes on the part of Limestone County that is within the City of Madison (equalizes ad valorem tax for all residents of the City of Madison). It is really just an equity issue, Dee Fowler, Madison City Schools Superintendent, said. To have Madison County voters impose taxes upon Limestone County citizens does not seem to be a good thing. I am sure whatever method either of these outside cities come up with to stick it to the citizens of Limestone County, the others will soon follow with the same thing. According to Limestone County Probate Judge Mike Davis, the portion of the City of Madison inside Madison County has more than 23,600 registered voters, and the portion of the city inside Limestone County has about 1,350 registered voters. He said it is unlikely the measure will fail because Limestone voters have little voice. Davis said he was unaware of the measure before he saw it on the ballot and said many residents may not know of the proposal. Although it is a statewide amendment, the measure requires a majority vote of Madison registered voters. It could pass statewide but still would not be implemented if it does not pass in Madison, Davis said. However, if the measure does pass statewide but fails in Madison, members of the Madison City Council would be allowed to call for subsequent elections every 12 months without legislative approval. “It appears to be an effort to ensure the success of the tax-raising measure,” Davis said. But if the measure fails to gain a majority of voters statewide, it could not be brought back before voters without legislative approval. Davis said he does not recall any legislation that addresses taxation in annexed portions of a county, making this amendment groundbreaking. 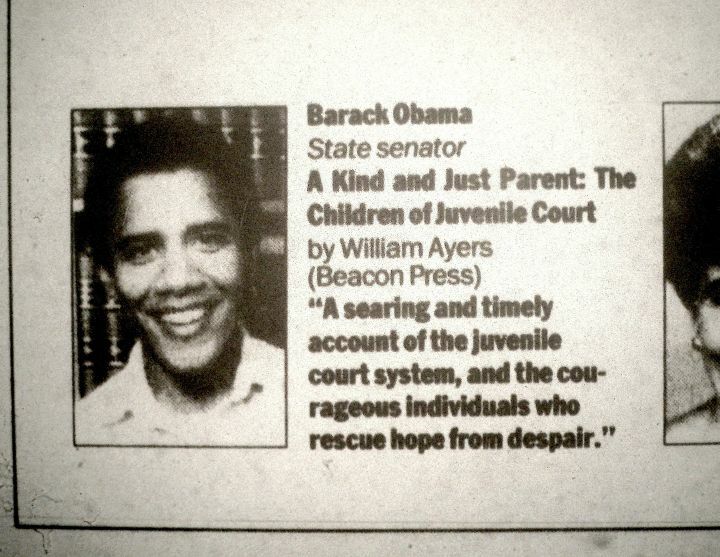 Barack Obama wrote a review of Bill Ayers’ book A Kind and Just Parent: The Children of Juvenile Court, on Dec. 21, 1997. He said the book was “A searing and timely account of the juvenile court system, and the courageous individuals who rescue hope from despair.” Obama is also mentioned in the book. Remember that Ayers bombed the Pentagon, NYC Police, and the Capitol. Remember that Ayers tried to kill Judges and their families. Remember that Ayers said “I wish we had done more” on 9/11. And then remember that Obama said that Ayers is “just a guy who lives in my neighborhood”. Courtesy of zombie, read the whole thing (Zombie’s contributions are must reads / sees if you want to understand how hateful and deranged the Left is these days). Dale Jackson of WVNN received and posted several documents regarding Parker Griffith’s medical practice. Here is a summary of the ‘Confidential Peer Review’, the entirety of which is posted at Dale’s blog. The ‘Confidential Peer Review’ was performed by Confidential Peer Review, of Kenosha, Wisconsin and delivered on December 21, 1988. The Review was led by Dr. Michael Zeihen of Kenosha, who contributed to the book ‘Measuring and Managing the Quality and Appropriateness of Radiological Services’. Zeihen prepared the Review with assistance from Dr. John Duttenhaver of Savannah, Georgia and Dr. David Weems of Savannah. CPR reviewed 107 patient records. Based on these findings, almost all (97%) of Griffith’s patients were provided care “below the generally recognized standard”: most through poor documentation, many through poor treatment, and some through harmful treatment. Based upon the findings previously mentioned in this Report, it is our determination that Doctor Griffith is practicing radiation oncology care far below the generally recognized standard. The substandard nature of his clinical practice is quite prevalent and is confirmed by all our consultants. The Review recommends giving Griffith “the opportunity to review the findings” and “Due to the fact that this Report documents substandard care, we recommend that Huntsville Hospital strongly consider instituting those steps that would lead to the termination of appointment to the Medical Staff for Doctor Griffith and the revocation of his clinical privileges”. Dr. John Raymond Duttenhaver, who still practices radiation oncology in Savannah, said Tuesday he doesn’t remember all of the specifics of Griffith’s review, but he does recall that it wasn’t a good one. “I do remember the overall impression that it wasn’t favorable,” he said. Kudos to McCarter and The Times for reporting the story. I sent an email to the Alabama Board of Medical Examiners asking if they are reviewing Griffith’s license now that the Peer Review is public. I’ll be sure to share the response. The Code of Alabama, Title 34 Professions and Businesses, Chapter 24 Physicians and Other Practitioners of Healing Arts is the law setting up the Board of Medical Examiners and governing the practice of medicine . Stephanopoulos then asked Obama to explain his relationship with Ayers. Obama’s answer: “The notion that somehow as a consequence of me knowing somebody who engaged in detestable acts 40 years ago, when I was eight years old, somehow reflects on me and my values, doesn’t make much sense, George.” Obama was indeed only eight in early 1970. I was only nine then, the year Ayers’s Weathermen tried to murder me. The same night, bombs were thrown at a police car in Manhattan and two military recruiting stations in Brooklyn. Sunlight, the next morning, revealed three sentences of blood-red graffiti on our sidewalk: FREE THE PANTHER 21; THE VIET CONG HAVE WON; KILL THE PIGS. If convicted, Kernell faces a maximum of five years in prison, a $250,000 fine and a three-year term of supervised release. A trial date has not been set. Tommy Battle defeated Mayor Loretta Spencer in the race for Huntsville Mayor, 56% to 44%, with 37,958 votes cast. Mayor Spencer carried 7 of the top 10 of Huntsville’s largest (by vote) precincts. The top three were: Cove United Methodist, Aldersgate, and Weatherly Heights (note that Absentee Voters would actually count as the third largest precinct). These three were also Tommy Battle’s largest by-vote precincts, and then Battle carried the next three largest precincts: Hillwood Baptist, The Dwelling Place, and Chapman Middle School. Northwest Huntsville turned out for Battle in big numbers and high percentages, for example: First Missionary Baptist (1049 total ballots, 76%), Johnson High School (1006 ballots, 75%), and Ed White Middle School (870 ballots, 74%) . Mayor-Elect Battle’s best precincts (by %) were AAMU, Calvary Hill, Showers Center, Lewis Chapel, and New Shiloh. Mayor Spencer’s best precincts (by %) were Monte Sano, Southwood Presbyterian, Cove United Methodist, Absentee Voters, and Trinity United Methodist. For City Council District 5, Will Culver defeated Richard Gipson by 53% to 47%. For School Board District 1, Laurie McCaulley defeated Pat King by 55% to 45%. For School Board District 5, Alta Morrison defeated Susan Currie by 53% to 47%. UPDATE: Voter turnout was about 33% (37,958 votes / 113,807 registered voters). Turnout increased in the run-off, which is unusual – the August election had a turnout of 28%. In August, 30,047 voters cast their ballots – before you check my turnout math, note that about 6,000 people registered to vote between August and now – so turnout increased in both real and relative terms. BTW, there are about 202,000 registered voters in Madison County. The polls are open from 7AM to 7PM. Elected officials take office November 3, 2008. For Huntsville Mayor – Tommy Battle. Note that in last week’s mayoral debate, Battle announced that he supported Wayne Parker for Congress. [EDIT: I realize that Battle may have been coy when he said "I support Parker" - maybe I'm reading too much into his comment, but he has attended GOP events for about a year...] I like Mayor Spencer but IMO she’s been resting on her laurels for the past few years [EDIT: Note that Mayor Spencer implicitly endorsed Senator Sessions when she said that the next Mayor would have to work with Sens. Shelby and Sessions]. For City Council District 5 – Richard Gipson. Will Culver is his opponent. For School Board District 1 – no opinion. Pat King versus Laurie McCaulley (State PTA President). For School Board District 5 – Susan Currie. Alta Morrison is her opponent.